Anti-him messages to Las Vegas, Nogales Mexico, Mississippi, Atlanta, & ???? After spending months trying studiously to avoid the election, I've decided I need to get in gear & do my work to influence the outcome of this election. 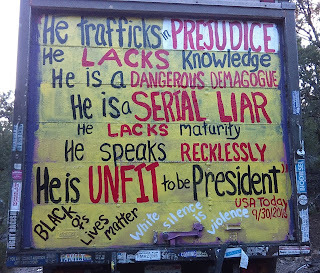 So I painted the back of my truck yesterday & I'm preparing to take these messages - courtesy of USA Today...hahaha - across the country, especially to swing states. You can help me make it there & everywhere! I have room for some stuff! If you need anything hauled across country, boxes or furniture or things, I have room. And I'm open to go almost anyplace, wherever the word needs to be spread! I'm also open to talking about taking one female passenger, especially if you are an activist. I'll be going to the SOAW protest of the border wall and the detention center there in Nogales next weekend, plus stopping at the pipeline protest in Mississippi, etc. 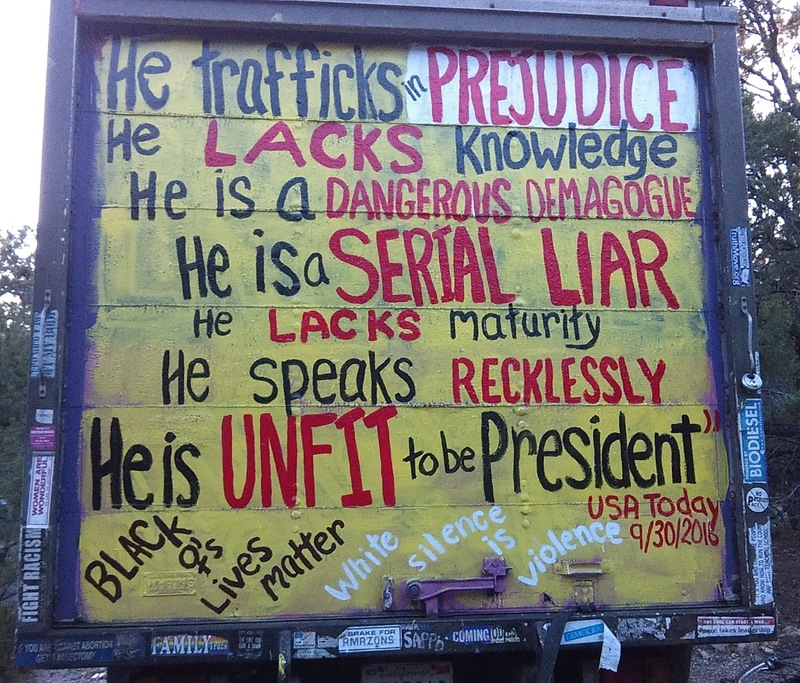 This is the new back of my truck, plus an older picture of what it looked like pre-usa today anti-endorsement, etc.